Tape Cuts Tape (Trouvé – Cassiers – Thielemans) will be exploring (some of) the roads of Belgium and Holland this coming November. As per usual, all these dates and more can also be found in Tourdates section. Tomorrow, October 1st, Rudy Trouvé and Mauro Pawlowski will play a duo set at Oude Beurs to help celebrate the 10 year anniversary of Radio Centraal’s “De Wolkenbreiers” programme. This will happen at 8 pm sharp after which Mauro will rush off to Filmhuis Klappei where he will play a solo set after “Ashik Kerib”, his film of choice, has been shown to the audience. Find the full addresses in the tourdates section. Both events seem rather unmissable. Another eventful weekend is coming up! 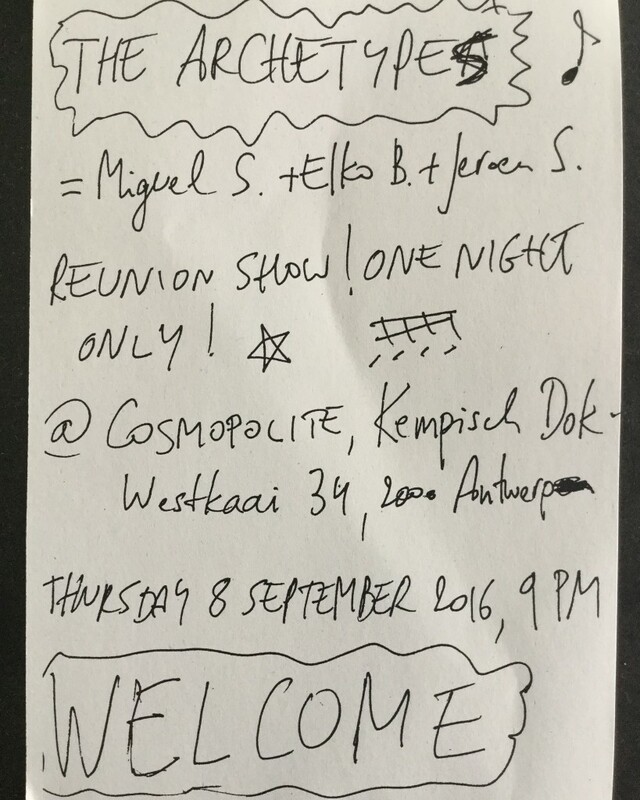 Tomorrow, Thursday 8 September, The Archetypes are reuniting for a one-off show at Café Cosmopolite in Antwerp. Miguel Sosa, Elko Blijweert and Jeroen Stevens will be improvising together for the first time in years. Scroll all the way down to see the flyer for this concert. On Saturday, Rudy Trouvé, Daan and many others will be playing seperate sets at special (monumental) locations in the Dutch town of Bergen-Op-Zoom. Info and links about both of these shows can be found, as always, in our Tourdates section. Argentina’s finest Miguel Sosa of The Archetypes, Cassini Division and Strumpets fame was invited for a rare interview on yesterday’s Het Kralenspel radio show, which you can listen to below. On the 16th of April Rudy Trouvé will play twice in Antwerp. At 2 pm he will play a duo set with percussion wizard Eric Thielemans in Fat Kat to celebrate Record Store Day. At 10 pm it’s time for a solo Heaven Hotel Songbook set at the Leftfield festival in CC Berchem. Exciting times, 3 new Heaven Hotel releases, 5 Heaven Hotel label nights with live Heaven Hotel bands..
Their brand new vinyl is ready, and can be pre-ordered in our shop There are original interpretations of The Pyramids, The Ventures, The Shadows and – cultband avant la lettre – The Jokers and Front 242. You can see them live on our label nights! Then there is the new Tape Cuts Tape vinyl, expected around March 13. Also available for pre-ordering in our shop. This one can be obtained as vinyl or CD, your choice. And then, to celebrate, there is a double vinyl (comes with free CD), God Owes Us a Swimming Pool. 26 tracks with a pretty good overview of what has been released on Heaven Hotel. What’s more, the whole compilation album can be streamed for free! We hope you enjoy our new site, new releases, and hope to see you on one of the label nights! In March ‘God Owes Us a Swimming Pool’ will be released- a compilation of stuff released between 1995 and 2015’, a double album feature (Vinyl and CD) of Heaven Hotel releases. To promote this and other upcoming releases (Tape Cuts Tape, The Tone Zones) releases Heaven Hotel is coming to a place near you in Belgium under impulse of the engines of Heaven Hotel, Rudy Trouvé en Elko Blijweert and organize a few Labelnights. Between interesting and representative, between obscure, improvisation and always surprisingly unique. For more info (Dutch) watch these pages. 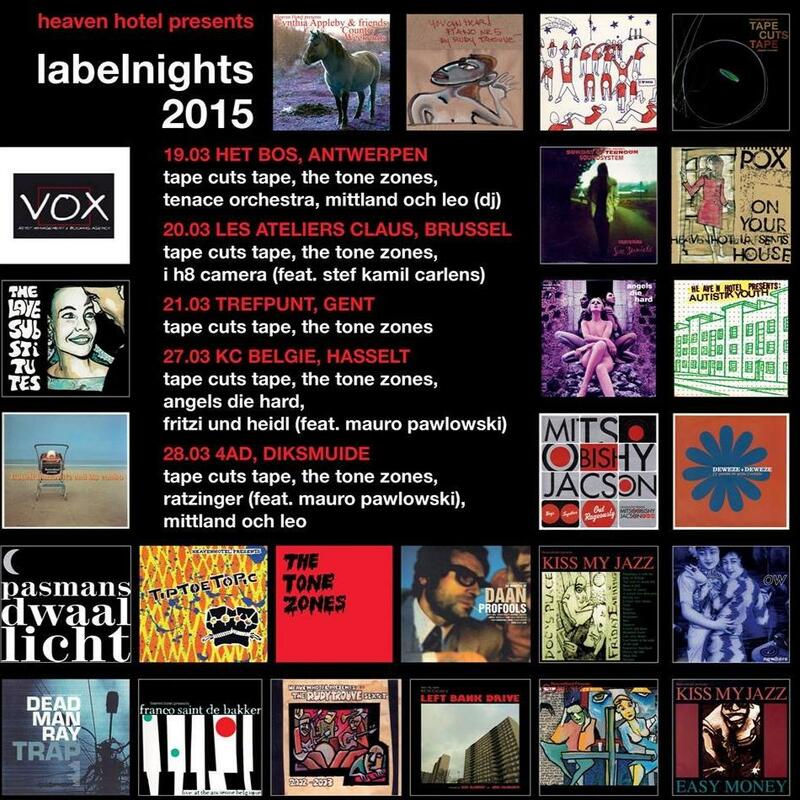 God Owes Us a Swimming Pool is a Heaven Hotel double vinyl compilation being released because of the Heaven Hotel label being in existence for 20 years, which is accompanied by a tour of Heaven Hotel bands all over Belgium, in different venues, with different bands, and labelled as the Labelnights 2015. Some old, some new will be presented, and in any case every night will be unique and full of surprises, for both the bands and the audience. Tape Cuts Tape will be playing every night because of their upcoming 3rd release, and also The Tone Zones, a new formed duo of guitarists Elko Blijweert (o.a. Dead Man Ray and Gruppo Di Pawlowski) and Milan Warmoeskerken (Mittland och Leo). They will release their debut album also in March, full off surfinstrumentals and elektronics. 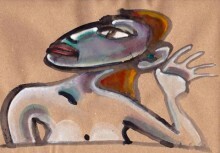 They have a few nice intepretations of The Pyramids, The Ventures, The Shadows eand – cultband avant la lettre – The Jokers. On December 20 Rudy will have an exhibition of his paintings at Coffee & Vinyl , a specialized coffee bar and vinyl store in antwerp’s south. The record store is home to a massive collection of music, spanning most genres, both new and second hand, and organizes regular exhibitions. Rudy Trouvé will be in the shop on the 20th December to open the expo and play a little live set..
Great news: Rudy has an expo at Bernaerts. 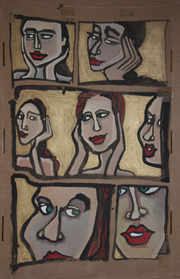 From the 20th of May until the 25th you can discover some new paintings, drawings and videos. Rudy will perform solo during opening night, which starts at 19. Bernaerts, Museumstraat 25, 2000 Antwerpen.